Every aspect of your perception of life comes from your brain. All of your senses, your experiences and your emotions, all your thoughts, dreams, desires and actions begin there. But there is an epidemic that is destroying the minds of many people. It is plaguing them with an overwhelming amount of internal stimulus, immobilizing their bodies and rendering their brains ineffective at best and self-destructive at worst. This is Your Brain On Anxiety. 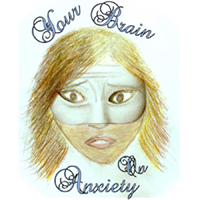 If you feel like taking a break from the plentiful selection of funny and lighthearted Fringe shows, take a step into the human mind with the cast of “Your Brain on Anxiety”. Feeling not an insignificant level of anxiety myself in a mad scramble to find parking and getting to the venue with 2 minutes to spare, I nearly walked right into a masked figure lurking just inside the doorway. The show begins as a seminar of sorts, with an educational bit on the human brain and how it functions. Anxiety is something we all experience at certain levels, but the show quickly focuses in on cases where it becomes a seriously impeding challenge for all sorts of people from all walks of life, and demonstrates how it manifests in their experiences and their lives. Relatable scenarios of love, relationships, responsibilities, insecurities, obligations, expectations of others and many more factors can be the sources of anxiety that we encounter throughout our lives. Masked cast members acted the parts of each characters’ inner voice, needling them and nagging and expressing their plaguing doubts and fears. It’s frightening the way that we speak to ourselves when we are the only ones listening. The production uses a powerful performance of poetry and spoken word, with phrases that really hit home. A perfect amount of comedy to lighten the mood on a serious topic adds another great facet to this show. The production resonated with me in many ways, from relating to the same inner demons many characters expressed, to empathizing with others as it brought to mind loved ones of my own that struggle to deal with anxiety that makes it hard for them to cope with life. I sing praises of this show and what they’ve created. It reminds the viewer that there is always more beneath the surface, that each one of us lives with a struggle for balance between the things that cause us anxiety and the things that bring us happiness. It tugged on each of my heartstrings and reminded me of the importance of being kind and helping those struggling with mental illness. Each one of us has demons we must face, and struggling with depression and anxiety does not shape who we are. None of us can be define by others, our worth is not based on how others view us, and overcoming internal struggle is amazing and necessary. This show is a gem, and a must see. No doubt in my cluttered mind.